Research & development | IBE TECHNO CO.,LTD. To confirm the improvement of soil by "Super AKANE," the breathability and the penetration of water through the soil were compared. 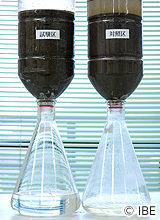 Two tubes were prepared with the same amount of treated soil and non-treated soil. And the same amount of water was put into the tube respectively. The speed and the quantity of flowing down water and the cleanness of the water were observed. Left : TEST 700ml of water flowed down in the soil with 3% of "Super AKANE"
Soil treated with "Super AKANE" was 3.5 times better in the property of passing water and breathability than non-treated soil. Later the soil property of keeping water was tested with the same soils. 2.5 times of water was kept in the treated soil. 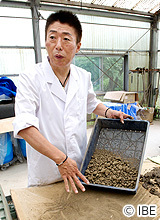 "Super AKANE"improves the structure of soil. The soil will be good at passing air and water as well as keeping water. The soil will be soft and good at absorbing nutrition and water, which enhances growing roots of the plants. Left : TEST π-water Roots are growing. Left : TEST π-water The shape of a strawberry can be observed. The test is continuing now.